Miami Shores police stopping traffic on NE 6th Avenue. 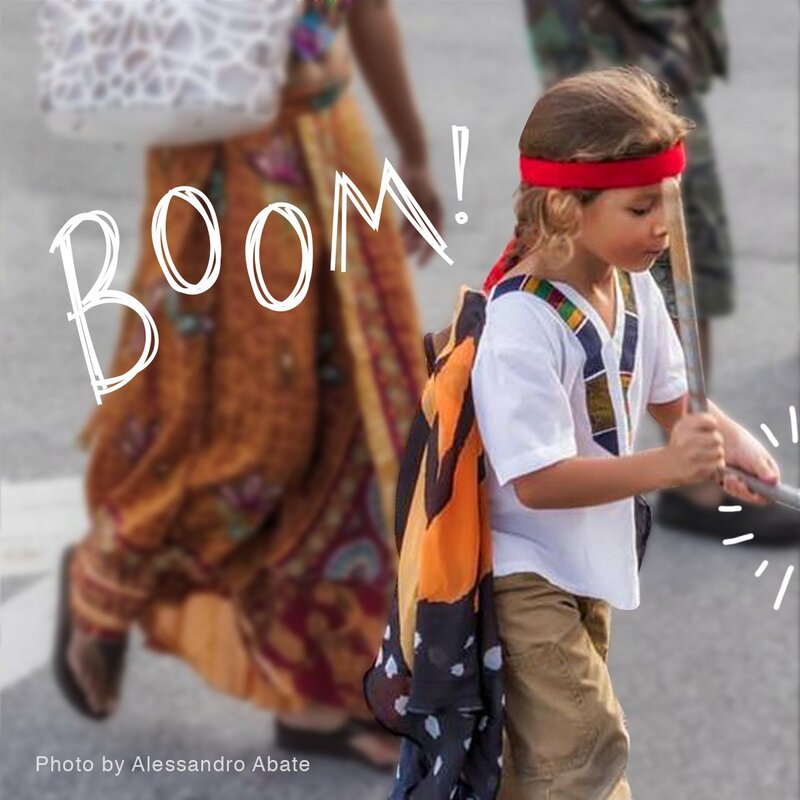 STOP…….and imagine a world where kids take to the streets in a peaceful manner to demand that adults start taking action to protect their futures…. We found some old photos dated 4/19/1972 in Flashback Miami Shores, showing Miami Shores police stopping traffic on NE 6th Avenue so the elementary school students could march against pollution. Wow! What happened? 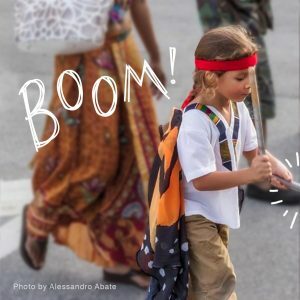 When did children stop marching against pollution? How can we get them re-engaged in the world around them? 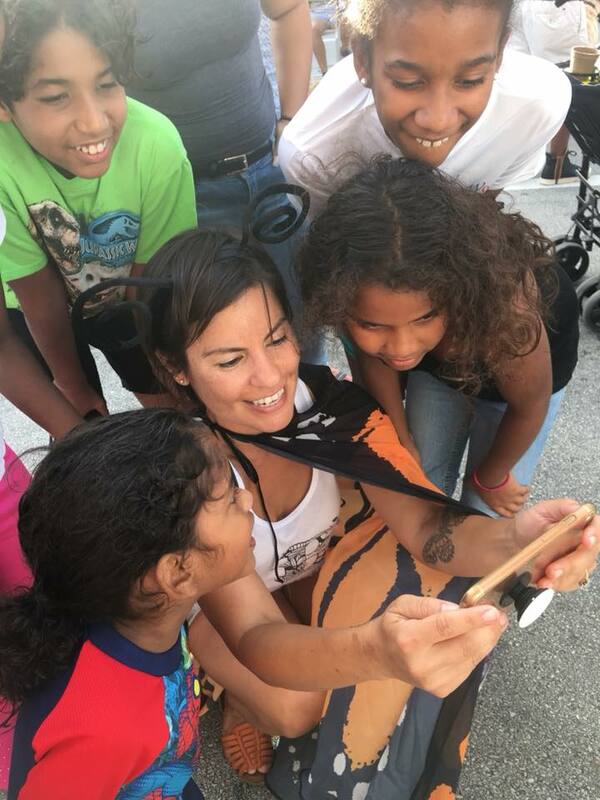 These photos inspired us at Bound by Beauty to do something to activate and inspire young people to take to the streets again. 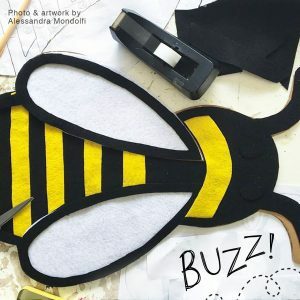 What better way to empower them than a positive Pollinator Parade that would be tons of fun and would educate people about the importance of pollinators? We found willing partners in Inspiration Pollination, and Pesticide-free Miami Shores. 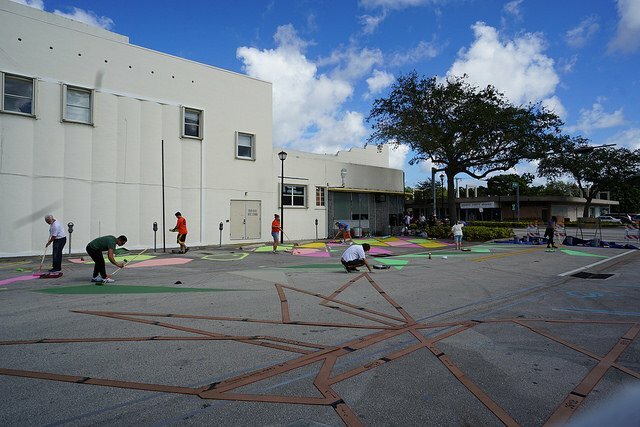 Inspiration Pollination is a nationwide collective that uses art to connect the public with the plight of pollinators, and Pesticide-free Miami Shores is an offshoot of Pesticide Free Miami, a coalition working towards local policy banning harmful pesticides and herbicides in public spaces. Melanie Oliva, the inspiration behind Inspiration Pollination, came up with a winning logo for the parade, and we handed out butterfly fans to various schools and community organizations to create a “buzz.” Come join us on Saturday to celebrate the pollinators that make our lives possible! 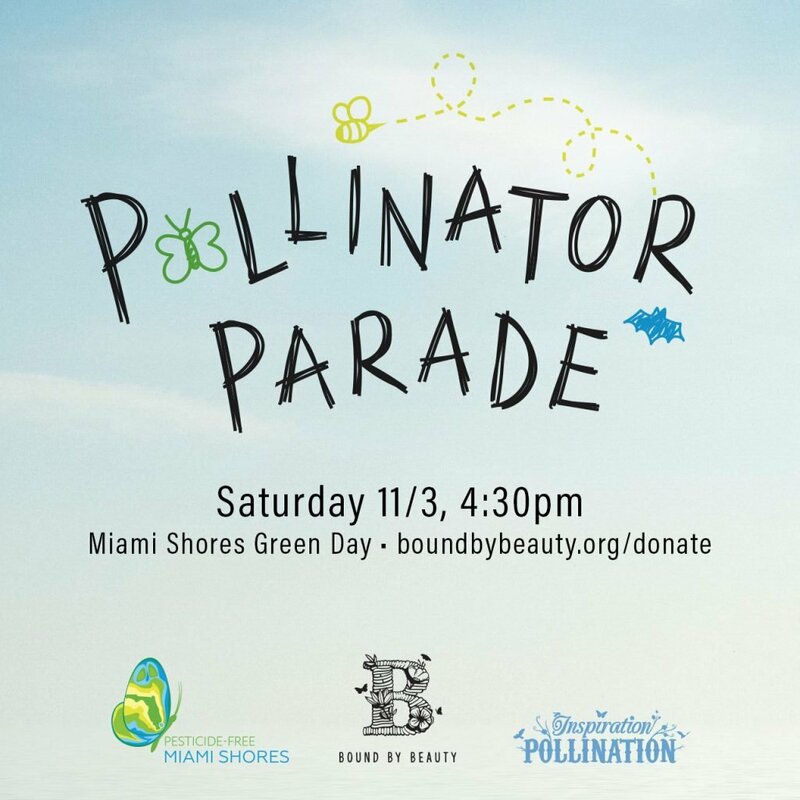 Wear a costume, make a sign, bring a musical instrument, and get ready to have fun and make history in Miami Shores in the first annual Pollinator Parade at #GreenDayMiamiShores! Pssst, there will be face painting too, from 3:30-4:30 at the Bound by Beauty booth! I love butterflies. Who doesn’t, right? But I never thought much about their night-time counterpart, the moth. That was until the day that my husband discovered a flower that would change my outlook on moths entirely. Up until then, I thought moths were okay. If butterflies are like your cool, world-travelling friend with the fabulous wardrobe, moths are like that friend’s old college roommate, Janet—who is a dentist and lives in the suburbs and wears a lot of brown. Janet is nice. She’s fine. But you never think to invite Janet to any parties. Janet is okay. I knew that moths are pollinators, too and so, yes, also important. The how and why was fuzzy. I didn’t have for them anywhere near the awe and adoration I have for butterflies. Sorry, Janet. So here’s what changed…I can be long-winded, so just settle in 😉. A few months ago, my husband and I bought our first house. When we first went to see it, I thought the house itself was cute enough, but small and not at all the charming Old Spanish bungalow I had envisioned. Then we walked into the backyard…and found paradise. We fell in love with the lush canopy of fruit trees and swaying palms. And as we stood there, mesmerized by dappled sunlight and drunk off the breeze, we realized we already felt we were home. We bought the little house from a man with kind eyes named Tom, who told us it had only ever been owned by his family and it’s where his mom lived until she died. Her name was Nadine. I learned from a neighbor later on that Nadine once had a beautiful garden that, sadly, became overgrown and eventually was mowed over when she was too old to care for it. I also learned that she loved to collect orchids and would plant them on the marvelously gnarled bottlebrush tree right outside what would become our bedroom window. Of course we noticed the orchid leaves hidden beneath and between ferns, air plants, and myriad invasives. But we had no idea when or if they’d ever bloom. We also had no idea how many there really were and how truly spectacular a show we would enjoy over the next few months. One day, an orchid, one of Nadine’s Gifts—as I’ve affectionally started to call them, as if right now, for a bit of emotional oomph in the story—caught my husband’s eye and he called me out in a happy fluster as he’d done many times since we moved in. Nadine’s Gifts, we would learn, were resilient and neither neglect nor blade could defeat them—but that’s a tangent for another time. On the bottlebrush tree my husband had found a pair of small white flowers, each about the width of a quarter—they looked like mini calla lilies. Neither of us had ever seen an orchid that looked like that before, so I submitted a photo to my plant ID group and hoped someone would know. And, of course, they did (they the bomb). 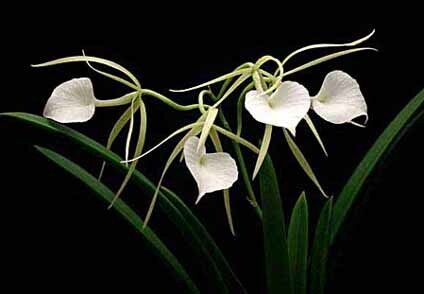 Brassavola nosossa, Lady of the Night, she was called. Some furious Googlin’ later and I learned that she is fragrant, but only at night. It turns out, that’s when she gets nice and smelly in hopes some dark and handsome moth will come and give her a good pollinating (honey, don’t we all???). We resolved to run out and catch the show at nightfall. In the moonlight, the pale little flowers of the plant were brilliant against the dull bark of the tree. She was dazzling. We leaned in and inhaled expectantly. Jasmine? No, more gardenia…some citrus, maybe? But with a delicate musk and somehow melancholy…like losing yourself in a love song—by Adele. Over the next few weeks (or so. Not sure how long. I don’t want to over-commit.) I’ll take you on an educational cabaret of the natural world’s night-time delights and its mysterious staffers: The Night Workers. The Moonlighters. Pollinators & Pistils: A Bed Time Story…I will work on the title of the series. 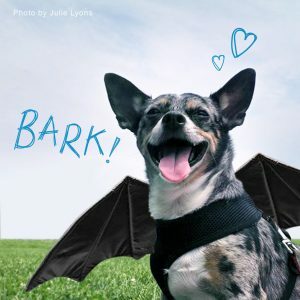 Jen Gonzalez lives in Miami Springs with her four cats who she will often describe as terrible people, her beleaguered dog and her very patient husband. She likes to play outside with plants and butterflies and is sometimes socially awkward. But she’s a snappy dresser, so no one minds. 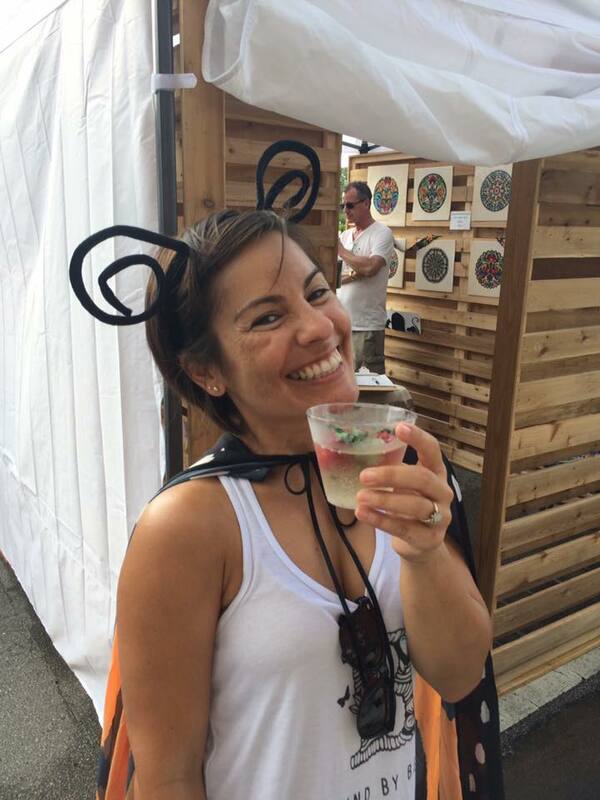 Jen works in a field entirely unrelated to butterflies, but she makes up for that with wine. Oh, and she’s part of Bound by Beauty. Living in the modern world has lots of advantages. Medicine has conquered many diseases. Technology gives us smartphones and the Internet. Economic progress enables us to enjoy higher incomes and more interesting careers. In many ways, we’re better off than those who came before us. Some of the changes over the past 100 years offer us little reason to cheer, however. Many in today’s society seem to think that the answer to our problems is to just take a pill. This is a deadly misconception, as medical professionals are quick to note. The belief that drugs can give us happiness leads only to addiction and other short-sighted coping strategies like denial or withdrawal from others. You’ll enjoy far more benefits if you engage in healthy activities such as gardening. So sink a spade into a clod of soil and get ready for a better life. All you need is a little sunlight, a little dirt, and a big desire to feel better. Sharper thinking. A pair of studies showed reduced risk of dementia among seniors who make gardening a regular part of their lives. Researchers believe the combination of mental and physical activity helps to keep the wits sharp over time. Better sleep. Gardeners enjoy deeper, more restful sleep than sedentary people who stay inside. Beating the blues. 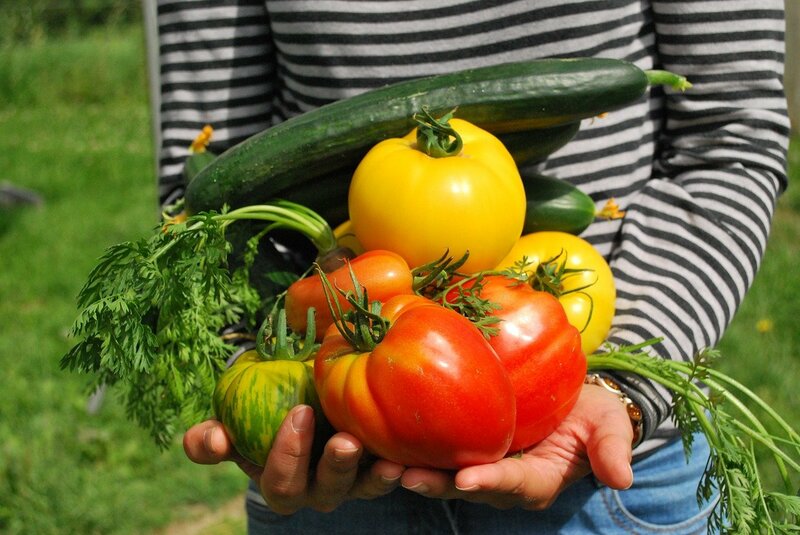 A study by the Centers for Disease Control (CDC) reveals that gardening can help to relieve depression. This is especially true for those who garden at least 2.5 hours per week. Faster recovery from stress. Gardening promotes the release of brain chemicals that help mind and body to bounce back from stressful events. One study shows that getting your hands dirty can help cleanse your mind of its worries better than physically passive activities like reading. Don’t use that as an excuse to stop reading this article, though! More happiness. One study showed that seniors in particular enjoy a lighter, more positive mood as a result of gardening. This is partly due to improved diet, but it also results from the focused concentration growing a garden requires. Union with nature. Data shows that physical activity in a natural setting offers more benefits than exercise in an artificial environment. It seems there’s something deep in the human spirit that craves closeness to the outdoors and the wonders of nature. Improved social skills. 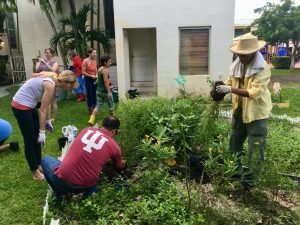 Gardening builds a sense of community among those who engage in it as a group, offering potent psychological benefits. Add it all up and it’s easy to see why so many people think of gardening as a tonic for the soul. This is some real food for thought, given that planting a garden need not cost more than a few dollars. This is true even for crowded urban settings. You can grow a lot of food in even the smallest patches of dirt, a fact to which fans of container gardening will gladly attest. Are you a gardening novice? Don’t fret. You’ll find tons of free information online, at libraries, or by asking local gardeners. Maria Cannon wrote this article for Bound by Beauty. Maria has suffered from depression and anxiety for years. Her hobbies–gardening, quilting, sewing, and knitting–play a major role in maintaining her mental health. 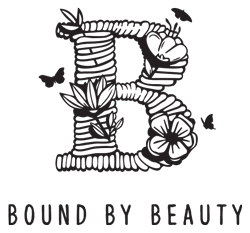 Those of us who are involved with Bound by Beauty believe wholeheartedly in the healing power of nature, whether the problem is rooted in the body or the mind. 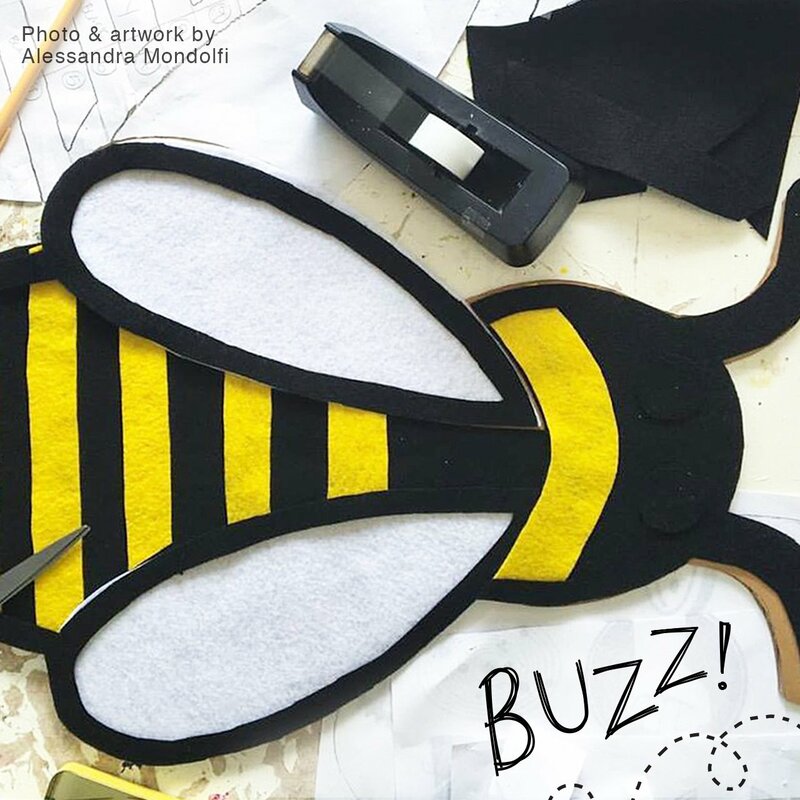 Whether you grow vegetables or butterflies — or both! — your immersion in nature will go a long way toward healing what ails you. 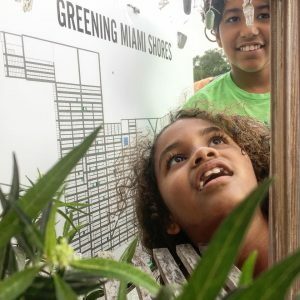 Plaza 98 transformed a short strip of ordinary road right off Miami Shores’ main drag into a happening place where neighbors can gather, talk, play, learn, dance, eat and more, and endangered native butterflies and plants can find sanctuary. It involved a whole lot of planning and a lot of grease from numerous neighborly elbows, and it all came together on Saturday night. It is hard to imagine what is about to unfold on 98th Street. A clever and artistic resident came up with a design of two rows of stylized pineapples, a salute to our historic past when pineapple plantations were more abundant than cars. 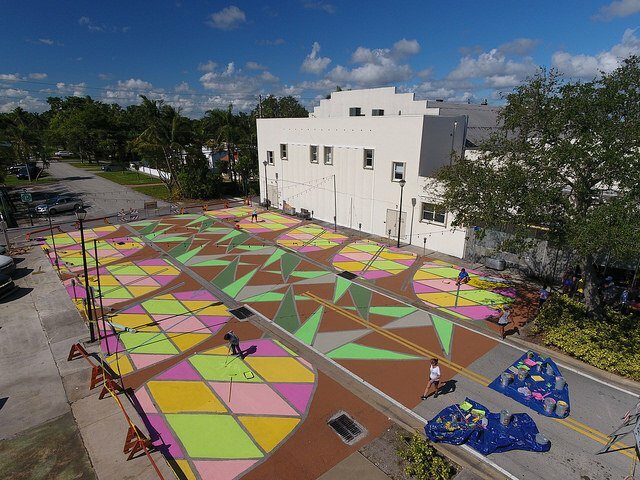 The design had to be approved by the county, and laid out in stencils by volunteers. 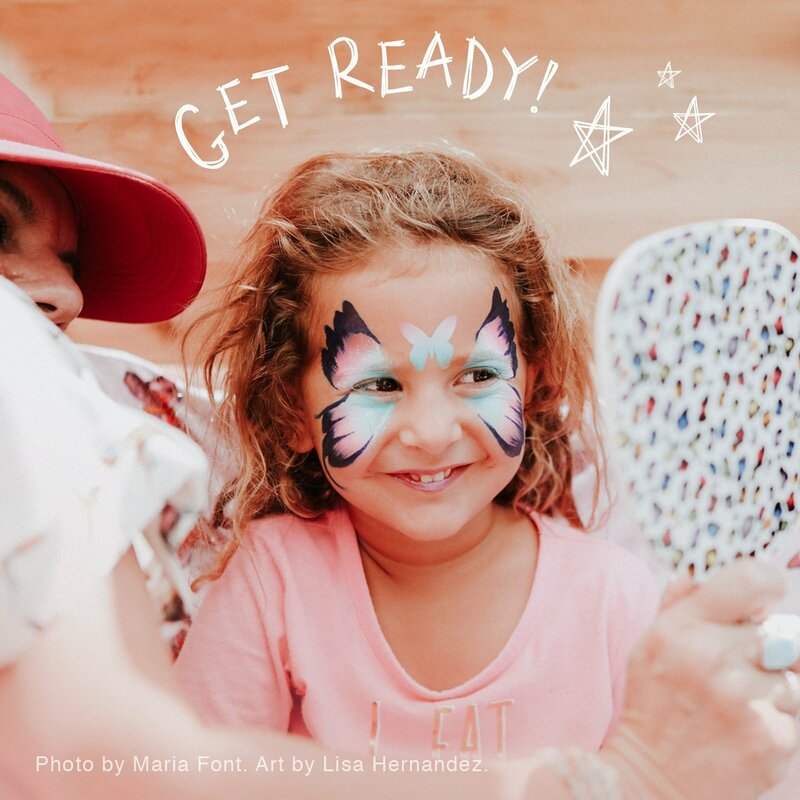 Other residents of all ages and sizes showed up and, armed with brushes and rollers, filled in the shapes with bright colors. 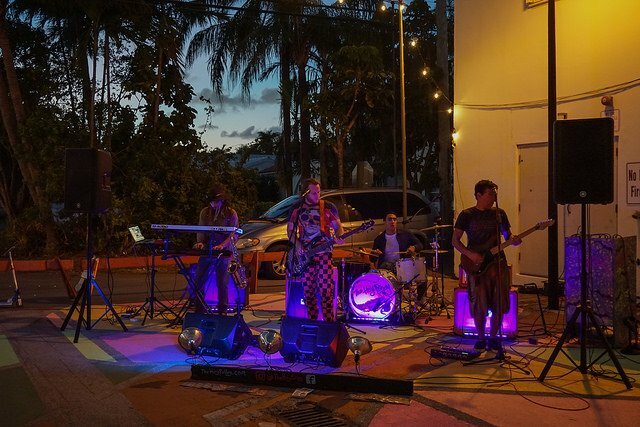 A smattering of local artists, hanging out and having fun! Rows of stylized pineapples planted in paint. 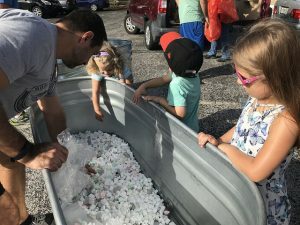 This project was completed in record time, thanks to all the volunteers who showed up to help. Besides the painting, tasks included furniture assembly and planter preparation. 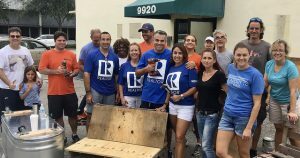 One of the crack teams of volunteer DIYers that helped turn wooden pallets and plywood into benches. Preparing the planters required attaching wheels and drilling holes. 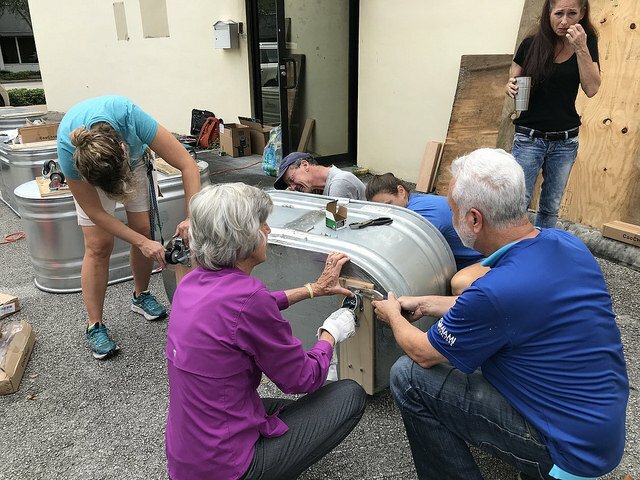 Who knew that Councilwoman Burch was so handy with tools? 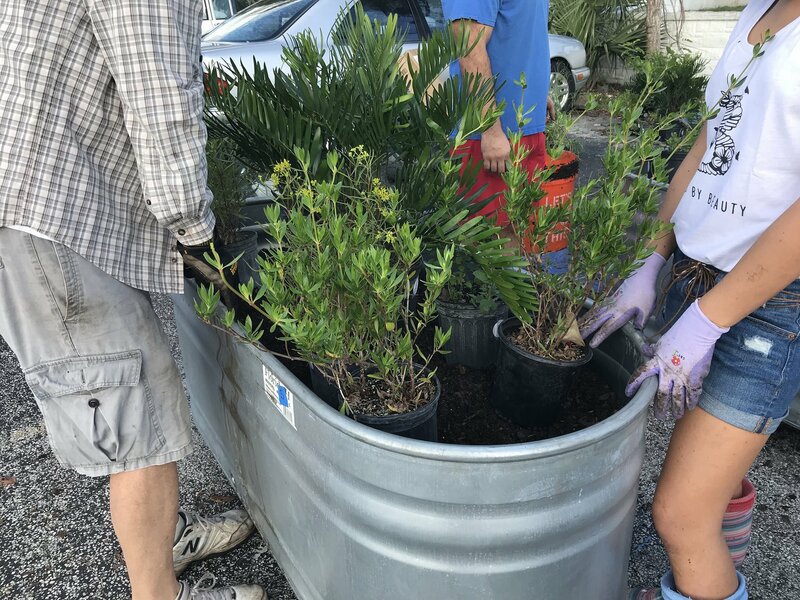 With the road painted, furniture assembled, and planters prepared, Bound by Beauty stepped in with a team of volunteers to fill the planters with beautiful native plants, several of which are threatened or endangered in the wild. We began by filling the bottom with aluminum cans and styrofoam pellets, which allow for drainage without adding to the cost or the weight. When you don’t recycle, upcycle! Potting soil was added next. Volunteers helped place the primarily native plants in the planters. Here we have non-native Giant milkweed and native porterweed, which will soon be sending little purple flowers skyward to entice passing pollinators. The plant in the background is coontie. Bound by Beauty will soon be publishing a very special report on this plant, and the treasures it enfolds. Those handy wheels enabled us to push the very heavy planters into place. In the future, the wheels will give flexibility as to how the planters will be used when the plaza is closed once a month to traffic. 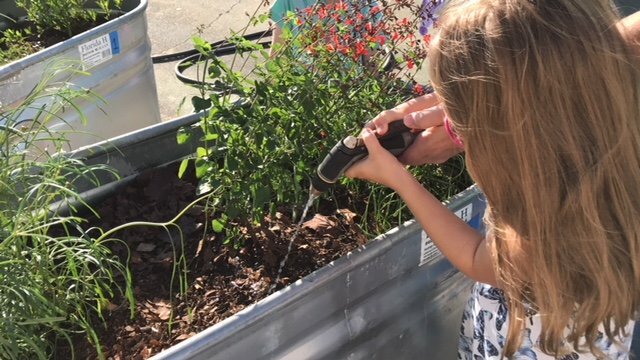 Last but not least, we had help watering the plants. Although drought tolerant when established, they need watering every day for a couple of weeks until they show signs of new growth. In this planter we put coreopsis and red tropical sage. So much for the preparations! Now it’s party time in the Shores! There was music by the Hoy Polloy. 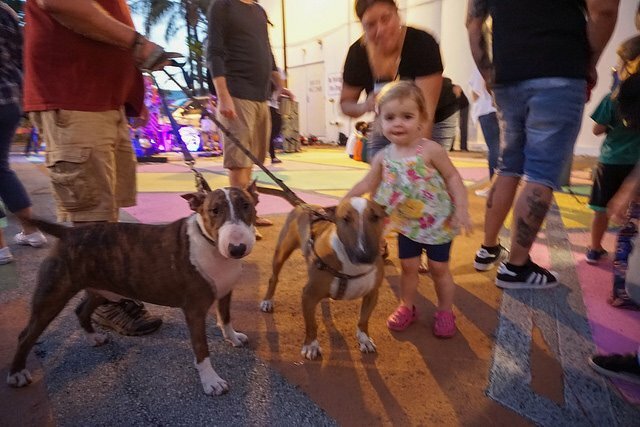 Patting dogs was the most popular activity for some kids! 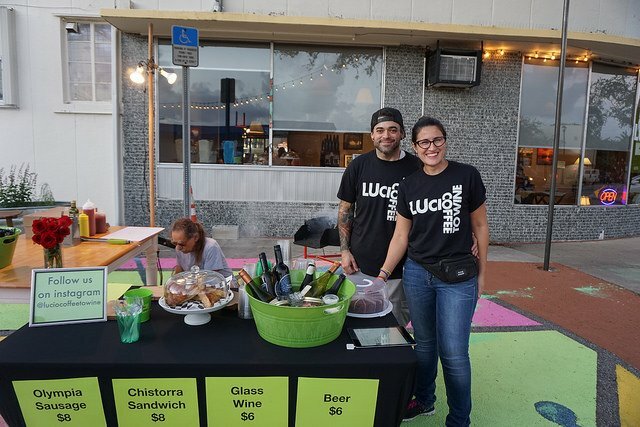 Miami Shores’ very own Lucio’s was on hand with delicious libations and food. Neighbors happy to mug for the camera. 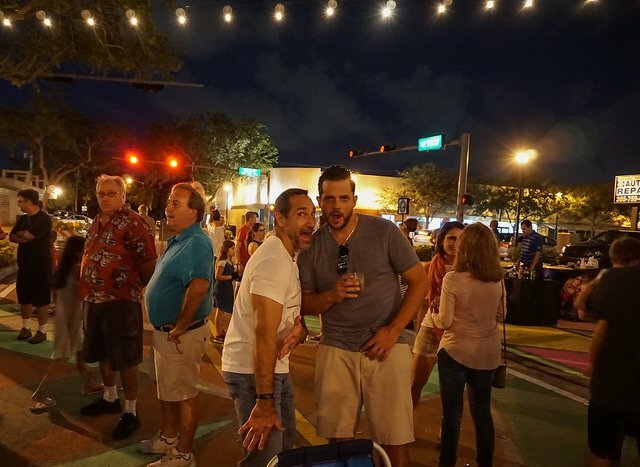 When is the last time so many people gathered in downtown Miami Shores? 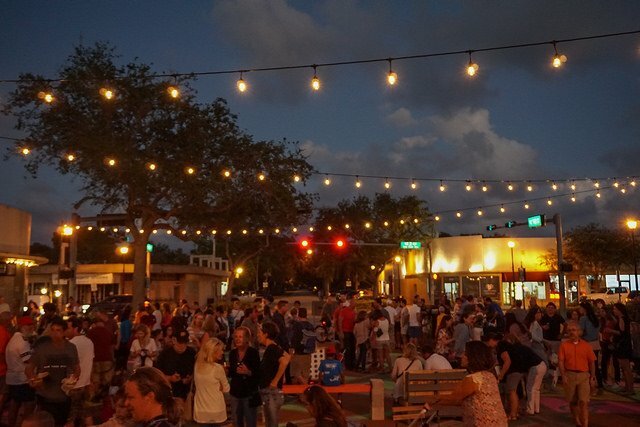 Plaza 98 is breathing new life into our village. Thank you to all who came out to work and party with your neighbors. Stay tuned for more information on Plaza 98 on the second Saturday in December, when Christmas will be in the air. 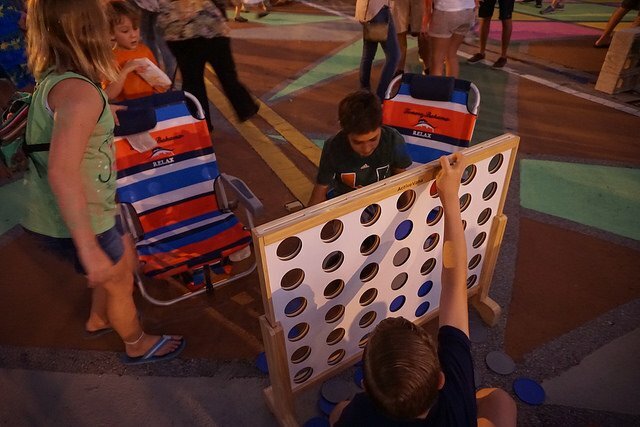 The Green Day Fair is a wonderful event in the life of Miami Shores. 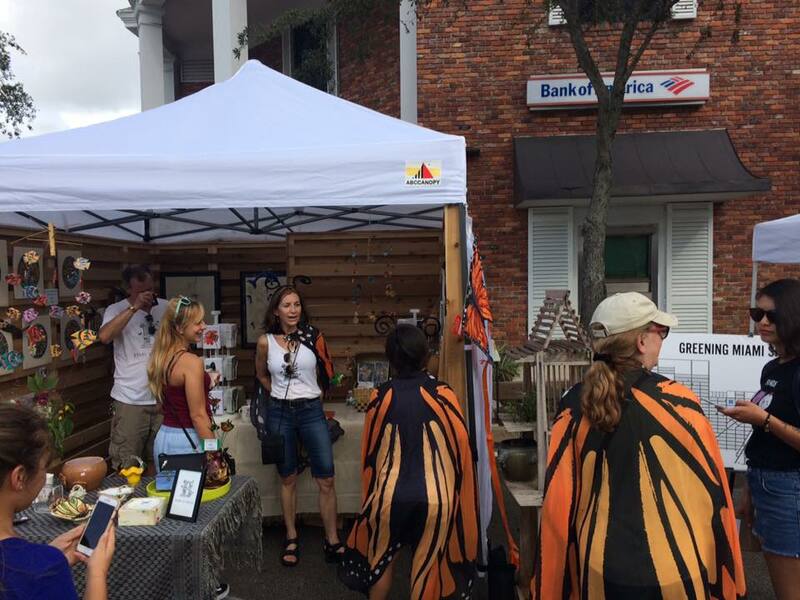 We close our main street to traffic, and come together as a community to shop for food and plants and gifts, to chat with neighbors, to listen to live music, to eat all sorts of delicacies, and, if fairgoers stopped by Bound by Beauty’s booth, to be awestruck. That’s Susan Howell there in the center. Susan donated beautiful treasures to Bound by Beauty, which she unearths at estate sales. Loved that amazing frog box with green rhinestones. I wonder who the lucky buyer was? What struck people with awe? Was it our booth, which was like no other, thanks to the easy-to-install, beautifully constructed cedar walls created by the talented Mike Oliva for his lovely wife, Melanie, an artist and activist extraordinaire (click here and here to learn more about this amazingly talented human being)? Melanie Oliva, artist and activist and the love of Mike’s life. 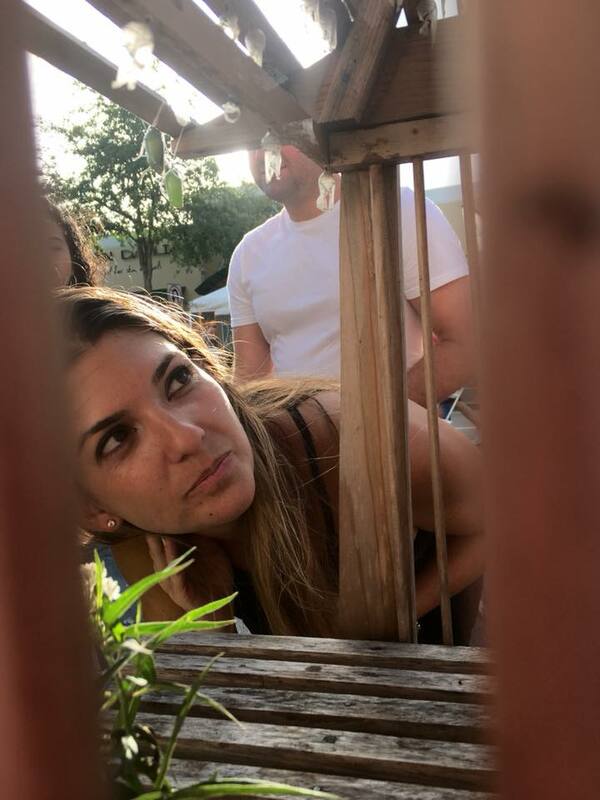 Or maybe it was Maria Font’s warm and winning smile as she greeted those who entered through the back door (besides being powered by passion for pollinators, Maria is a truly gifted photographer who could find magic in the mundane. Click here to see her marvelous images)? Plus, we were the only booth with a back door….and we had awesome vintage Polish cutouts of brightly colored birds and flowers, visible in the background, and all sorts of other unique and wonderful nature-themed items for sale. And did I mention we had oodles of handsome guys helping out, like that guy back there? Or were passerbys awestruck by our amazingly stylish friends, like Wendy Doscher-Smith and Jill Leslie? Too bad you can’t see Wendy’s go-go boots in this photo! Come to think of it, our outfits were pretty awesome. 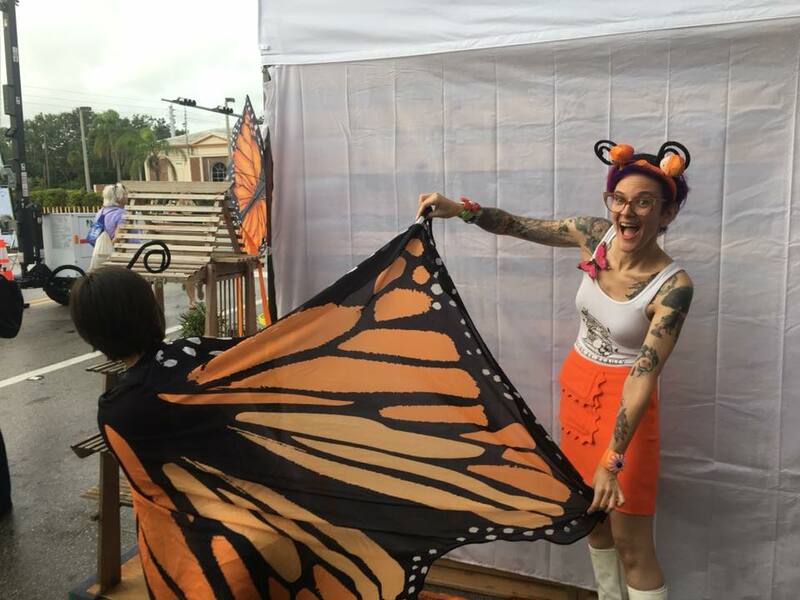 I mean, who doesn’t think Monarch wings and antennae are the next “hot” thing in Miami? 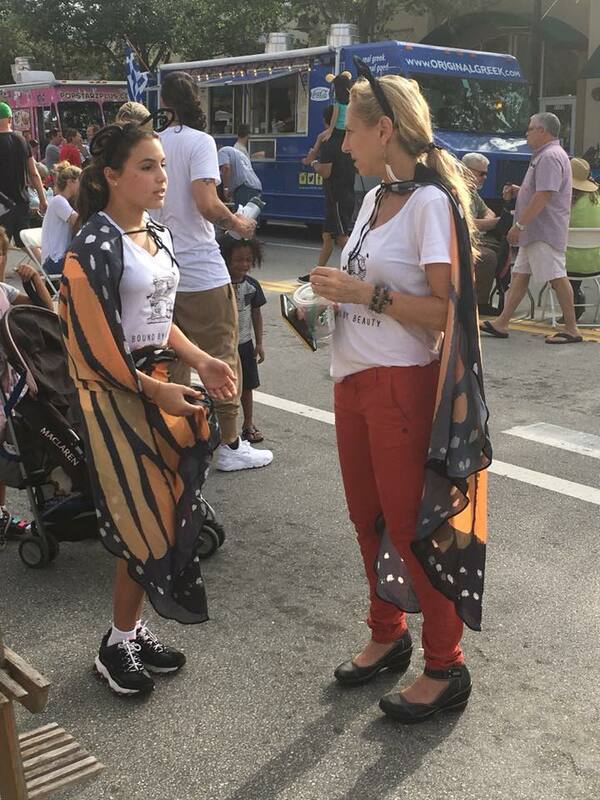 Wendy and Maria modeling butterfly couture. Beverly and Jill solving the world’s problems, right there on Main Street. 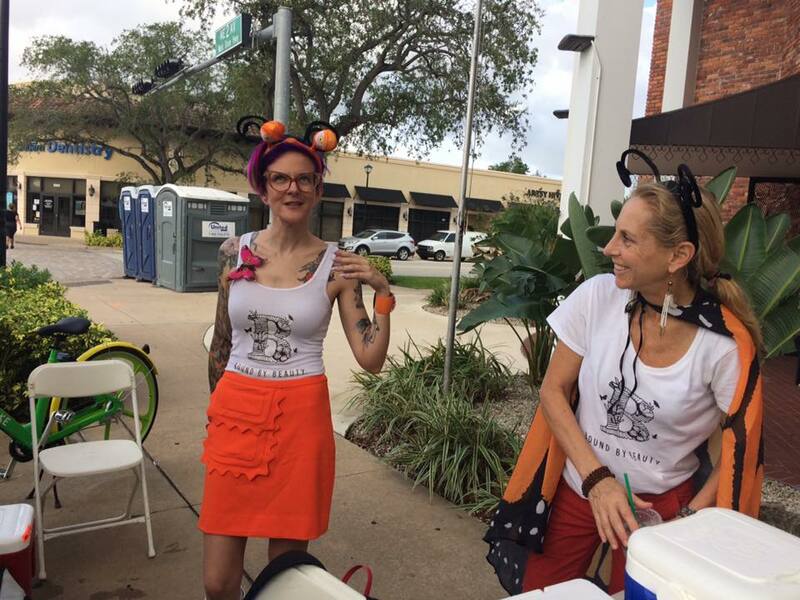 Yes, that’s Melanie Extraordinaire again, as she kindly loaned BbB the butterfly gear that had been broken in during the March Against Monsanto. Go, Melanie! Maybe it was our beautiful and unusual notecards featuring — you guessed it: butterflies — which proved a favorite with the crowds? 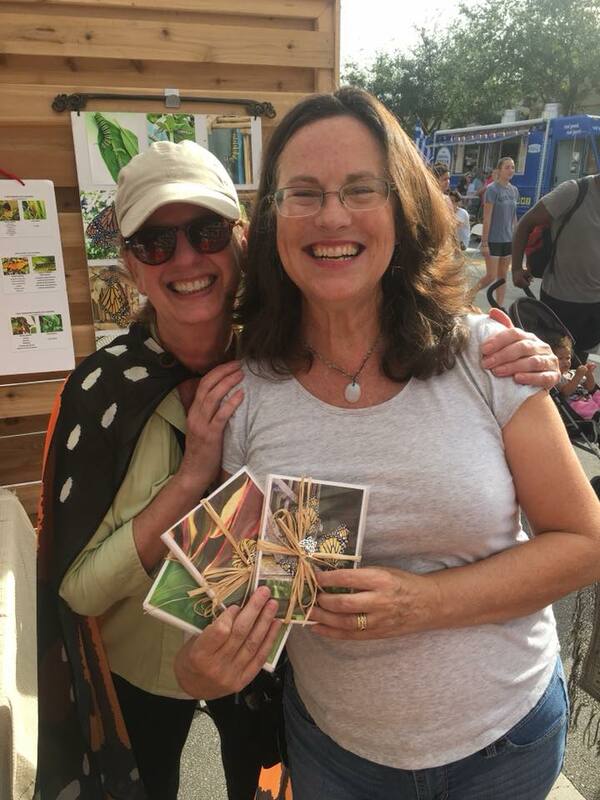 Kate Eaton, the creator of the Ruah service at the Ancient Spanish Monastery left, laden with our butterfly notecard sets (you can read about Kate’s magic here). 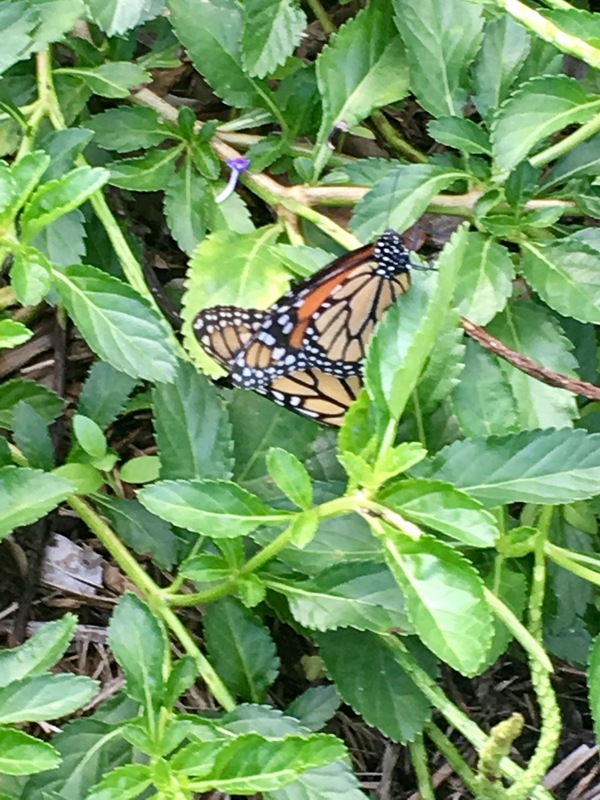 All butterflies were captured, figuratively, in Mary Benton’s garden, right here in Miami Shores. Was it our wonderful educational tools, that highlight the magical process of metamorphosis? No, I think the answer was right outside our amazing booth, as filled with treasures as it was. What are they looking at? Maria’s at it again, drawing children of all ages in to a world of beauty and mystery and magic and wonder and awe. What was at the root of this beauty and magic and wonder? It was our wonderful Monarch tower, made by Geoff Lee for the love of his life, Jean (I think we have a theme going here) and donated to Bound by Beauty, bejeweled with gold-crowned jade chrysalises and pupating caterpillars. Talk about performance art! The sharp-eyed among you might notice that this photo was taken elsewhere. True, but the magic at the fair was no different. Dreaming their last caterpillar dreams as the inner pupa takes over. 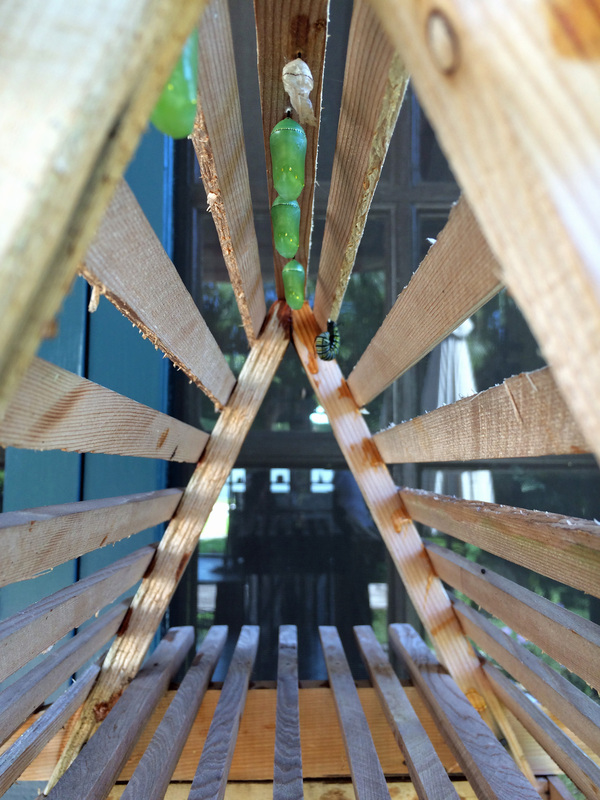 Many passersby were lucky enough to see a pearly white Queen chrysalis. 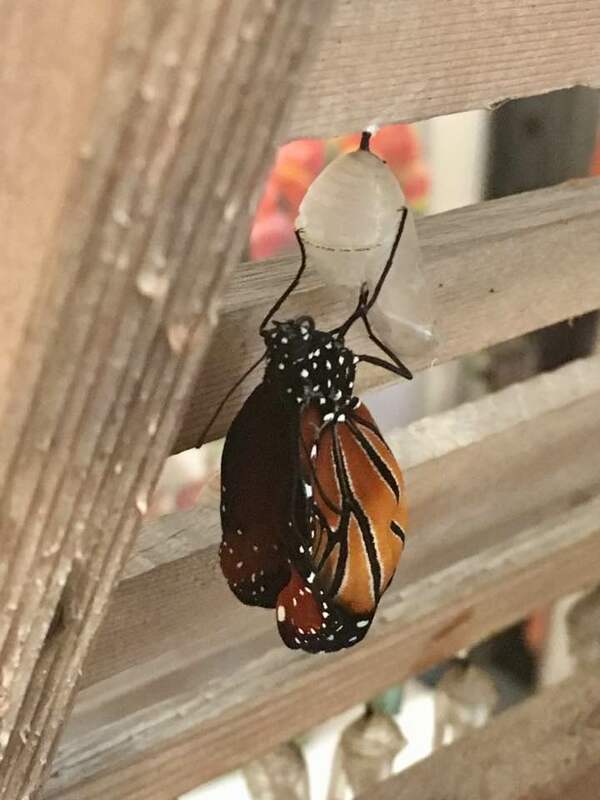 Here is a photo of the Queen herself, newly emerged. 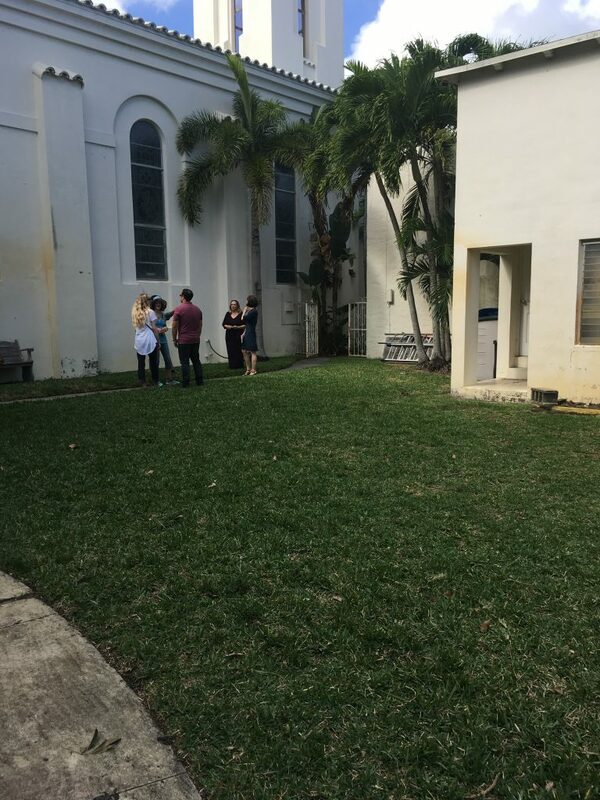 Let’s face it: if any one of us was plucked from our comfortable, air-conditioned existence and taken back in time 100 or so years, most of us would find it very difficult to survive life as a settler in the area we now call Miami Shores. The only respite from the heat on hot days was under a shade tree, or in the relatively cool waters of Biscayne Bay. Mosquitoes were often an inescapable torment and, with the Everglades and wet praireland nearby, venomous snakes like rattlers and cottonmouths were a constant threat. Settlers fished, farmed and foraged for foods that we can easily find in any number of nearby stores. Read Carol Hoffman-Guzman’s fascinating history of early farming in the area, and imagine yourselves in the shoes — or bare feet — of the early pioneers. 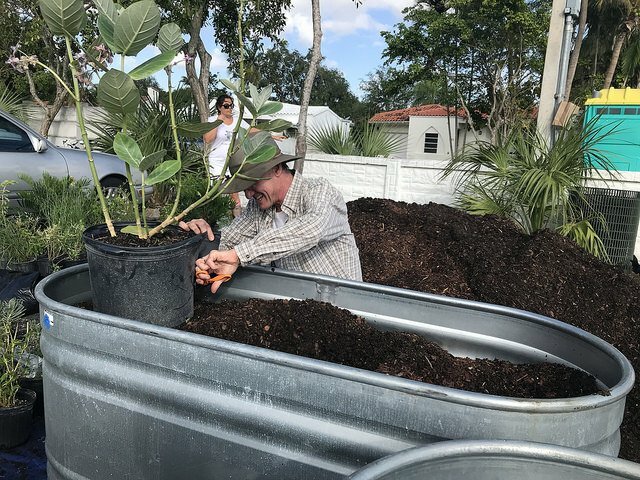 Vegetable and fruit farming has long been an essential aspect of life in the greater Miami Shores area, starting with the Seminole Indians and the later homesteaders in the mid-1800’s. 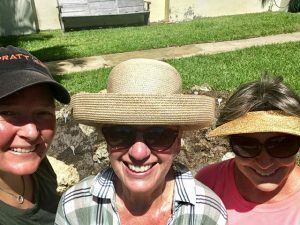 Let’s take a look at the evolving history of gardens, farming and agriculture among the early Miami Shores settlers. Various history books give hints about the settlers and their gardens. The earliest pioneers often survived on local plants, fish and game gathered from the surrounding environment, as did the prehistoric tribes such as the Calusa and later the Seminoles. Thelma Peters, in her book “Biscayne Country,” suggests that we should think of the Biscayne area as a wooded island surrounded by a grassy, wet prairieland. Many homesteaders soon realized that the wetlands were not decent for long-term homes or gardens, so they settled on the higher wooded area, called the Piney Woods. However, this area was primarily a rocky limestone ridge that didn’t offer much in the way of good soil. Additionally, the available plant life was rather thin – mostly scrub palmettoes, pines, and coontie plants, along with some native “weeds.” In the photo below, you can easily see how sandy the soil was. Photo used with permission from Seth Bramson’s “Boulevard of Dreams“. Miami Shores settlers from North Florida, Georgia, Alabama, and the Carolinas were mostly poor people from the back country. Seth H. Bramson, in his book “Boulevard of Dreams” about the Biscayne area, states, “The first settlers were essentially subsistence farmers. . .” (see footnote 1). Their focus was on simply growing enough food to feed themselves, their families and occasional visitors. Initially the output was only minimal, with little or no surplus food for trade. These Southerners also knew which native plants were edible, including pokeweed, sorrel, dock and other greens that were good in stews and soups. Huckleberries, wild Muscadine grapes and elderberries also grew in season in some areas in Florida. “‘We will persevere in our pleasant work and have the oranges, lemons, limes, tamarinds, figs, bananas, pineapples, mangoes, sappadillas, alligator pears, Jamaica apples, Japanese plums, sugar apples, guavas, papaws, and dates in readiness for our visitors. Mammee apples and cocoanuts require more time: a few of the latter have attained considerable size and may be expected to fruit in three years, but there are plenty in bearing in our neighborhood’” (see footnote 2). As Thelma Peters points out, Mr. Sturtevant used to take a handcart to the bay to gather seaweed which he used to mulch his plants (see footnote 3). Given the fertility of their garden, he was clearly on to something by adding organic matter that enriched the soil and kept it moist. 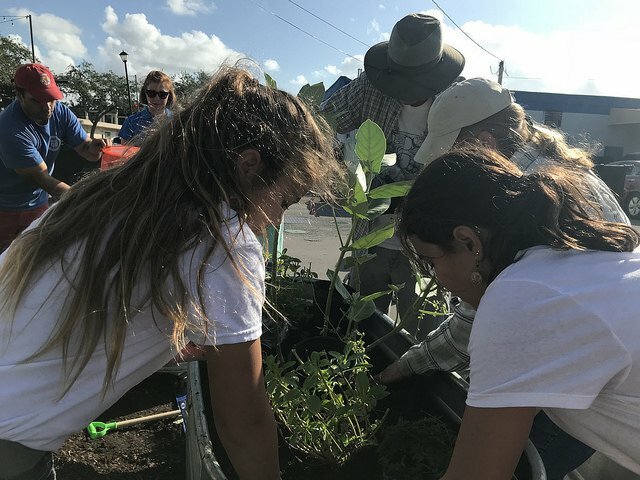 Early settlers gained some information about native plants from their Seminole neighbors, who occasionally canoed up the small waterways to visit and trade with the settlers. The Seminoles showed them how coontie roots could be safely processed to remove a neurotoxin to make starch. They also introduced other plants that were good for food and medicine, including the edible hearts of the local scrub palmettos and the small “Indian pumpkins” that grew in vines up into trees. Early settlers began to augment their diet of local fish and game by raising chickens, geese, pigs, and cows (mostly for milk). Branded pigs were allowed to run loose and occasionally they interbred with wild hogs brought previously to Florida by the Spanish. Subsistence farming was indeed the initial emphasis, but “truck farming” for sales to neighbors, outsiders and stores became a later interest. This business eventually became commercialized by families and companies, which purchased acres of land, especially for pineapples, coonties and various fruits that tolerated the sandy soil and dry season. Florida arrowroot starch made from coontie roots was sold locally and at markets in other towns, and was eventually shipped to other parts of the country. Packinghouses also shipped pineapples and other produce through new nearby railroad depots. Common garden plants, including fruit trees, could eventually be purchased from stores in Key West and later in Lemon City – and then be shipped or transported into the Biscayne and Shores areas. 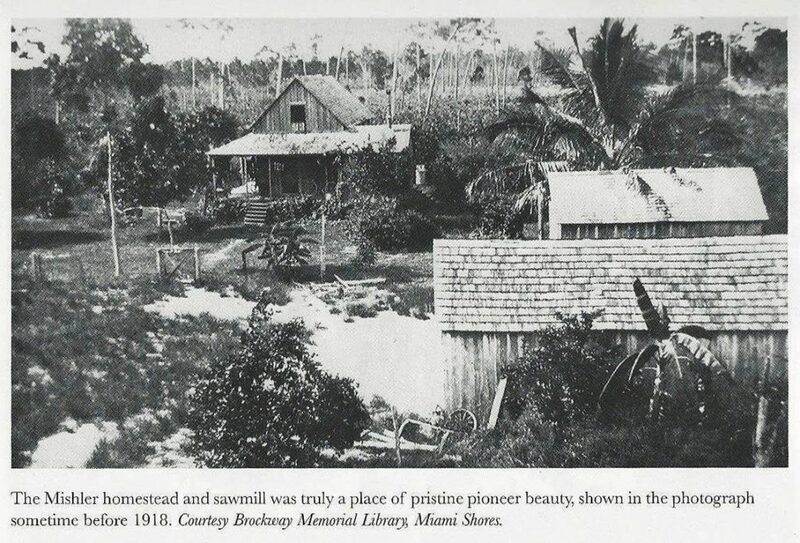 Local sawmills opened to harvest the formerly ubiquitous Miami-Dade slash pine in response to a growing need for houses and farm buildings. Photo used with permission from Seth Bramson’s “Boulevard of Dreams“. Note the children’s bare feet. Joe Blair, who arrived in the area in 1928 to escape cold winters up north, opened a business selling fertilizer and livestock feed to farmers in the area (see footnote 4). Although tillers and livestock feed have long since been replaced by lawn mowers and leaf blowers, Joe Blair’s is still open on 79th Street. 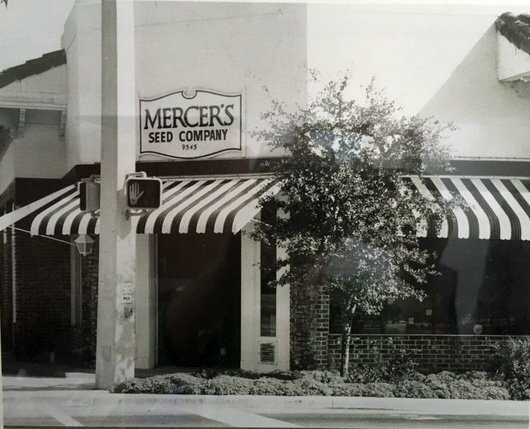 Later, in 1949, Mercer’s Seed Company opened in downtown Miami Shores, and quickly became a favorite gathering place for residents of the Shores who were interested in growing fruit and vegetables, and in landscaping their property. The Mercer Seed Company storefront on main street in Miami Shores. Photo courtesy of Brockway Memorial Library. Over time, as a community develops and increases in size, various farming practices and customs change. While vegetable and fruit gardening has long been a component of living in Miami Shores, many of us today are almost completely cut off from the nature upon which the early settlers’ lives depended. 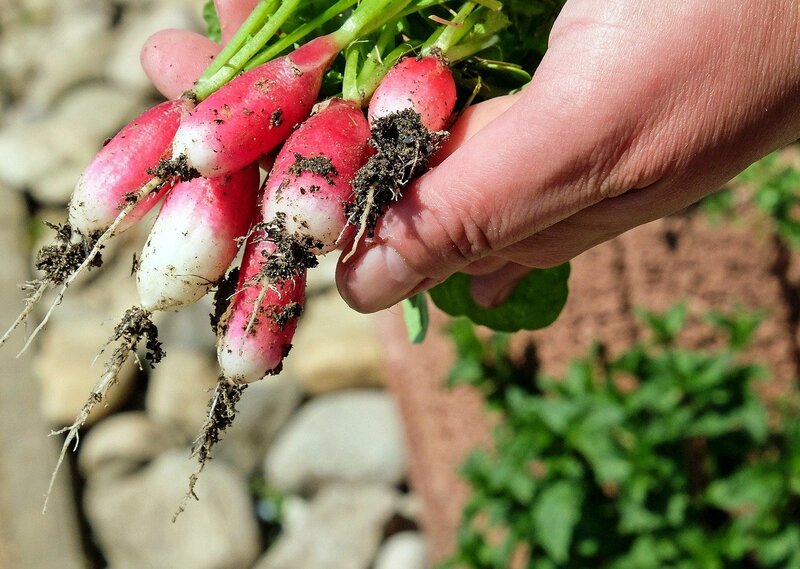 Our farming roots were further severed by changes to the landscape code that forbade the planting of vegetables in front yards, thereby depriving some residents of the ability to grow their own food. One current case, in which a resident is suing the village of Miami Shores over this part of the landscape code, is under appeal, and oral arguments are scheduled for August 21, 2017 (see footnote 5). 1. Seth Bramson, Boulevard of Dreams, A Pictorial History of El Portal, Biscayne Park, Miami Shores and North Miami (Charleston, SC: The History Press), 11. 2. 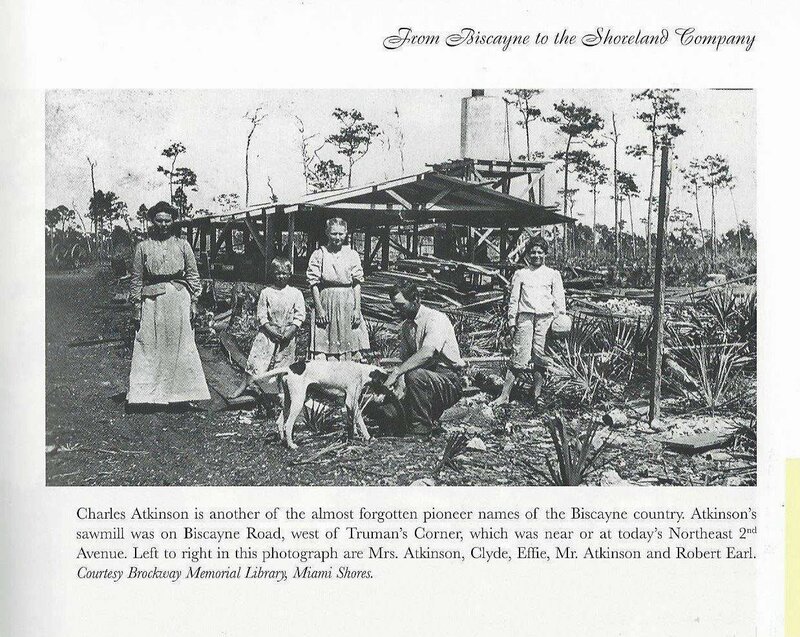 Thelma Peters, Biscayne Country 1870-1926 (Miami, FL: Banyan Books, Inc. 1981), 12. 3. Peters, Biscayne Country, 12. 4. 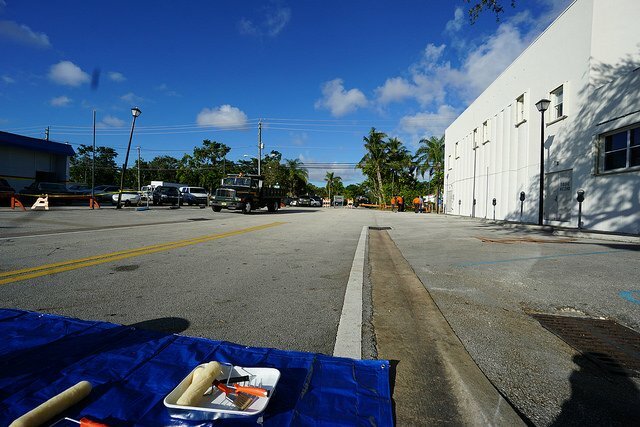 Erik Bojnansky, “Restoration Road: Once a seedy and dangerous thoroughfare, Miami’s 79th Street is looking up.” Biscayne Times, Vol. 16, Issue 6 (August 2017): 22-37. Dr. Carol Hoffman-Guzman is a 30-year resident of Miami-Dade County, with a BA in anthropology from Cornell University and a PhD in sociology from FIU. She currently resides in Miami Shores, where she has started researching the local history and plant life. Carol’s interest lies in the common people who developed the area, as well as a community’s use and interaction with native and introduced plants from prehistoric to modern times. 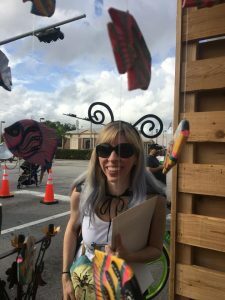 She is also writing a book about the plants and people of the Lake Okeechobee area. You can read her previous article for Bound by Beauty about the natural history of the area here. Aspiring or published women writers can join Carol and friends at the Miami Shores Community Church for her Women Writers’ Group. For more information you can contact Carol at carolmhoffman@bellsouth.net. 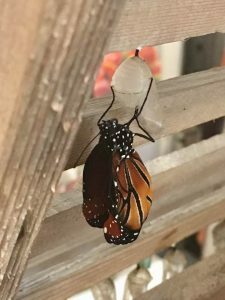 Update on the pine rockland and butterfly garden plantings: one of Bound by Beauty’s members watched an Atala butterfly christen a newly planted coontie with her eggs several days ago; and two of us watched this morning as a Sleepy orange butterfly deposited her eggs on the Bahama senna! 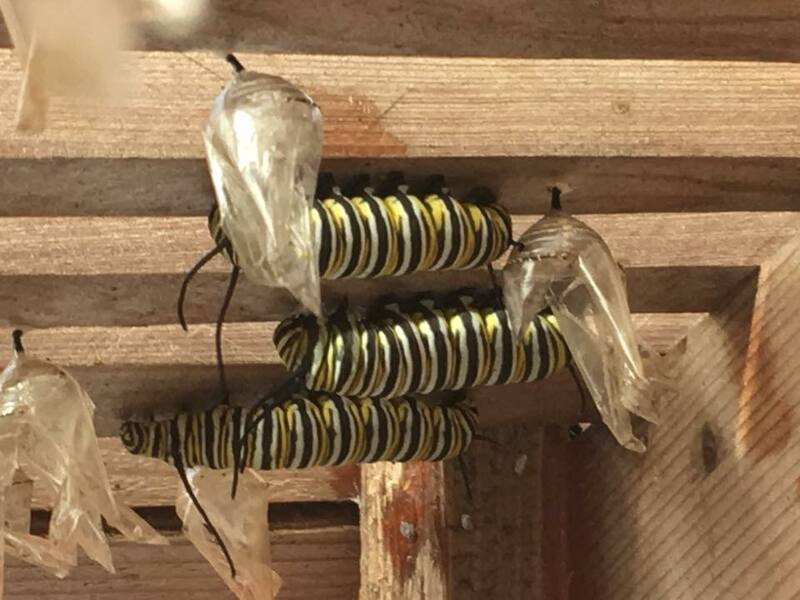 It is a wonderful feeling to provide a safe sanctuary for pregnant female butterflies and their offspring! Bound by Beauty gathered together with friends, neighbors, members of the Miami Shores Community Church Garden Program, and AT&T Pioneers to install a pine rockland, marking the second phase of the transformation of a spacious, sod-covered rear churchyard into a community garden and sanctuary for butterflies and other pollinators, as well as endangered native plant species. Pine rocklands are an incredibly rich, critically endangered habitat, containing numerous flora and fauna that are found nowhere else on earth. 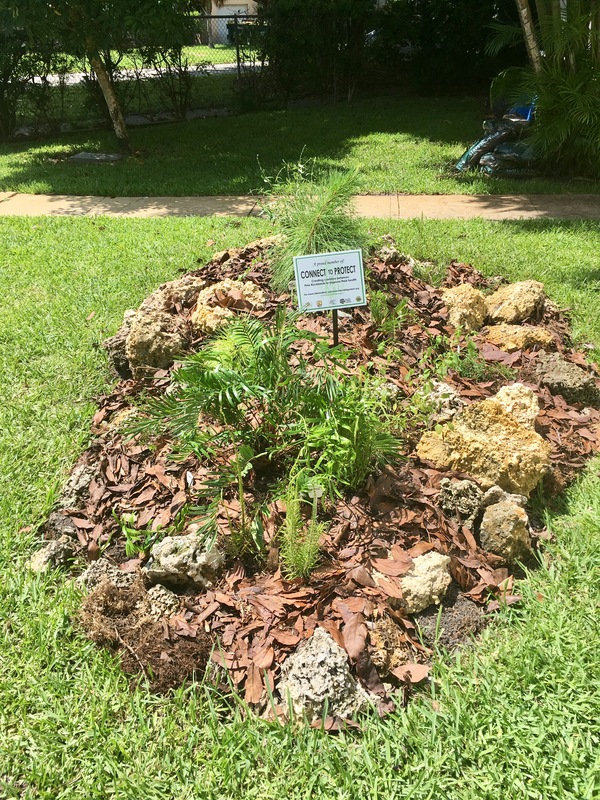 Fairchild Tropical Botanical Garden has a wonderful program designed to connect the few remaining fragments of pine rocklands, through plantings in urban gardens. You can read more about the Connect to Protect Network here. By joining this network, the Community Church school was given ten free pine rockland plants. 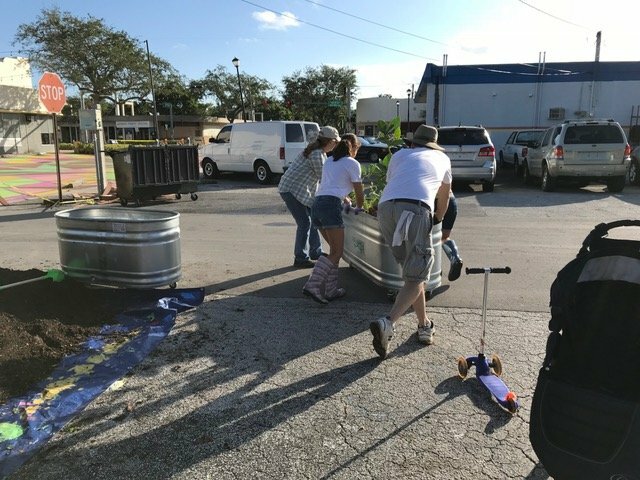 Additional plants and other supplies were purchased thanks to a donation from Meg Watson, Pastor at the Community Church. 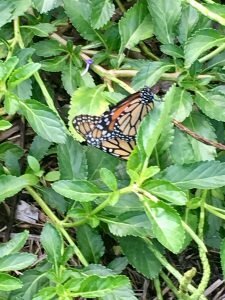 We started by gazing in delight at a pair of mating Monarch butterflies in the previously planted butterfly garden, which you can read about here. 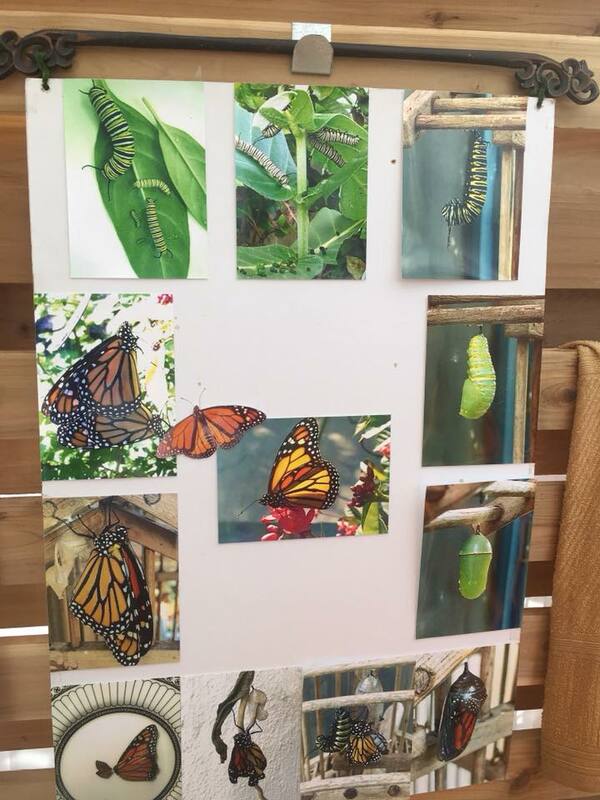 We added some yellowtop plants to the butterfly garden, as well as a Chaya, or Mexican tree spinach cane, whose lovely white flowers will attract nearly all native species of butterflies to its nectar (you can read how humans benefit from this plant here). Madeliene, Mike, and Melanie introducing the yellowtop plants into their new home. Susan is easing the largest pine out of its nursery pot, with Rolando, Mike and Melanie. 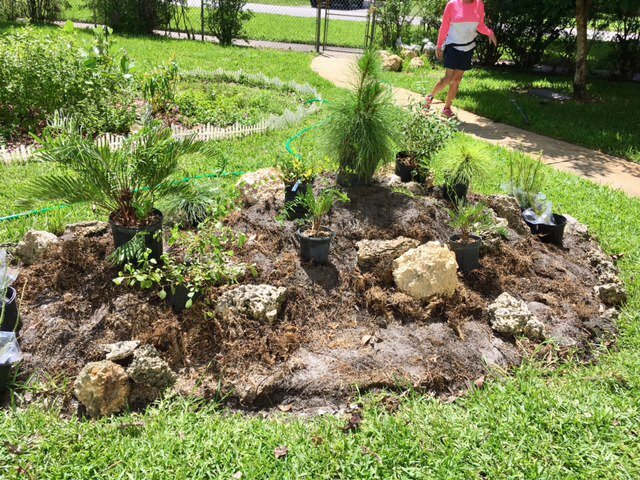 Others, meanwhile, started adding plants to the pine rockland. 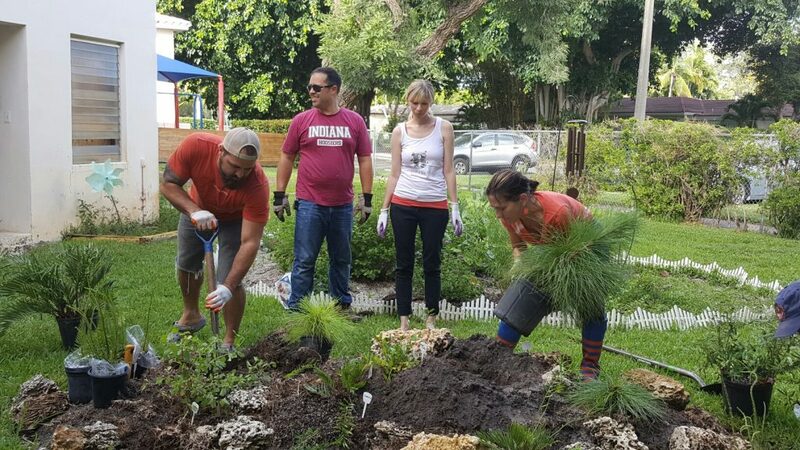 We planted three Florida slash pines, a tree whose disappearance due to urbanization in South Florida has led to the near-extinction of the Flying squirrel and the Red-cockaded woodpecker. 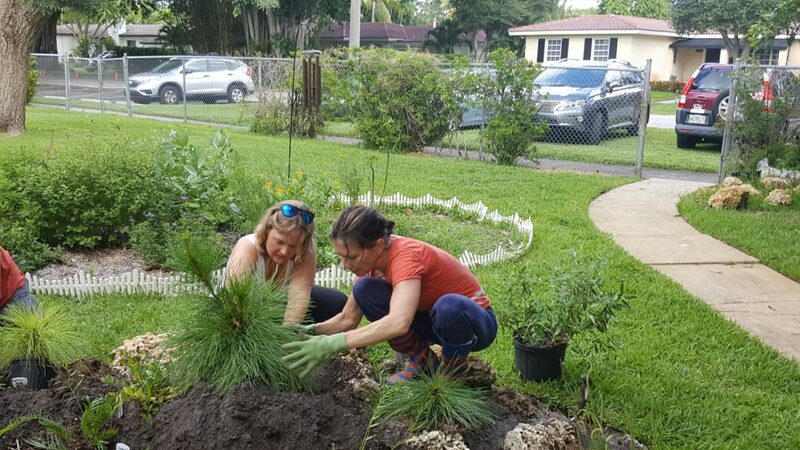 Helen and Susan planting a pine. 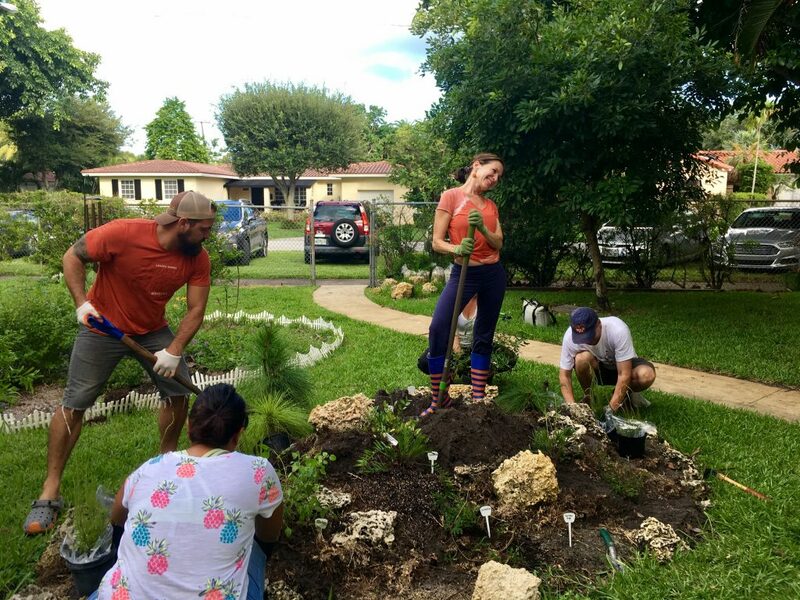 Susan standing on what is arguably the highest point in Miami Shores, while Adriana, Rolando, Helen, and Doug work on the pine rockland. 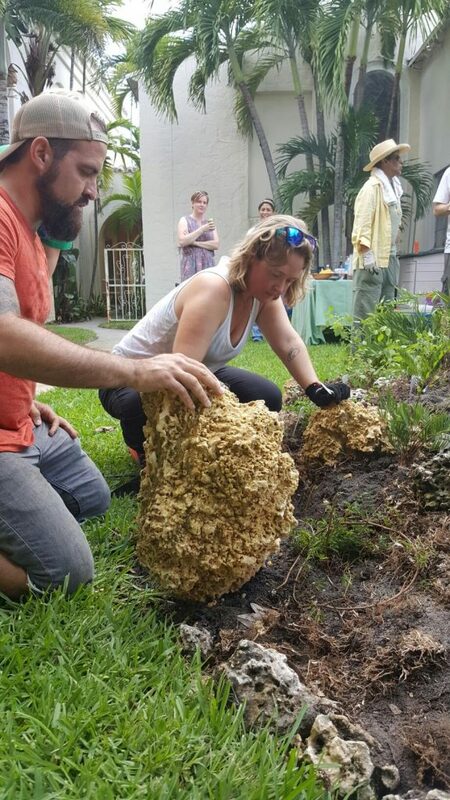 Helen and Rolando carefully position coral rocks donated for this project by members of the community. In addition to the Florida slash pine, we planted coontie, the host plant for the Atala butterfly; wild lantana; pineland croton, the host plant of the critically endangered Bartram’s scrub-hairstreak and Florida leafwing butterflies; Chapman’s liatris, as well as sunshine mimosas (the only species not associated with pine rocklands). All of these species are drought-tolerant once established. The pine rockland, finished off with leaf mulch donated by members of the community. A butterfly garden and pine rockland that are full of beauty and interest and life. The pine rockland may be little, but its message is mighty: we must join together to save nature, which we depend on for our existence. 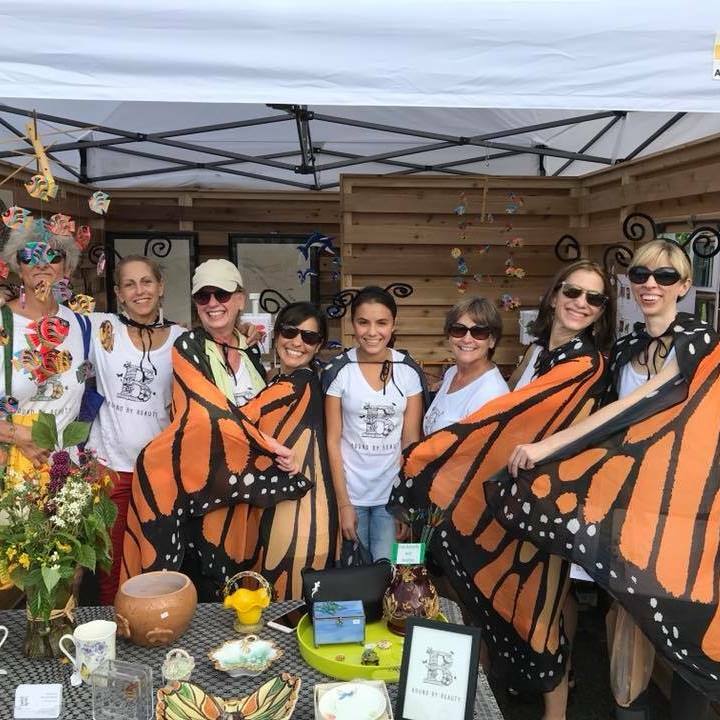 It was a joyful experience for everybody involved to take such positive steps toward healing nature and creating a sanctuary for butterflies, endangered plants, and humans. Stop by and take a look! And stay tuned as we find creative ways to expand Miami Shores’ first community garden. Mad dogs, Englishmen, and, apparently, members of Bound by Beauty are out in the midday sun. 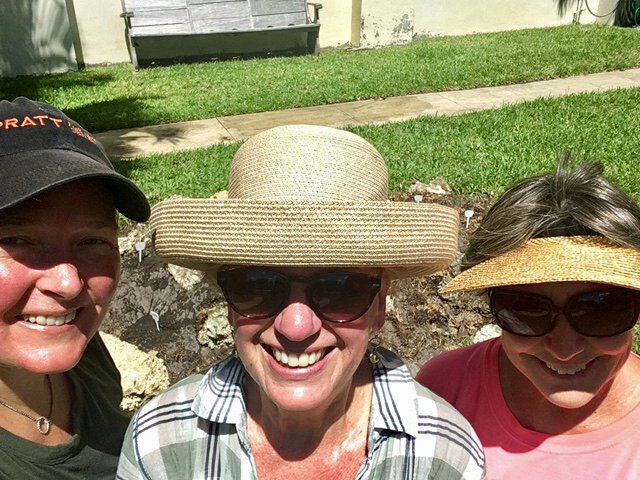 You can see from our rosy cheeks and noses, not to mention the glistening sweat, that we worked hard today to prepare the bed for the planting of the pine rockland plants on Saturday. Lucky for us, we love doing what we do! So what did we do? 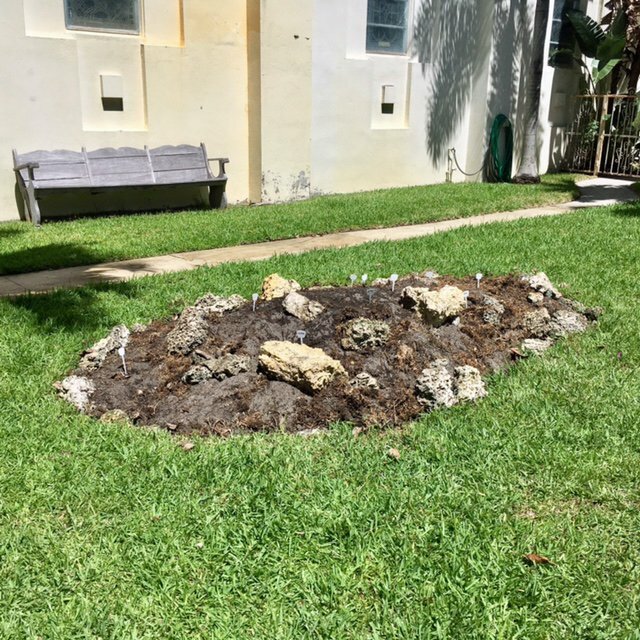 We removed the plastic tarp that was solarizing the bed, then started sculpting a pine rockland, using coral rocks donated by members of the community. 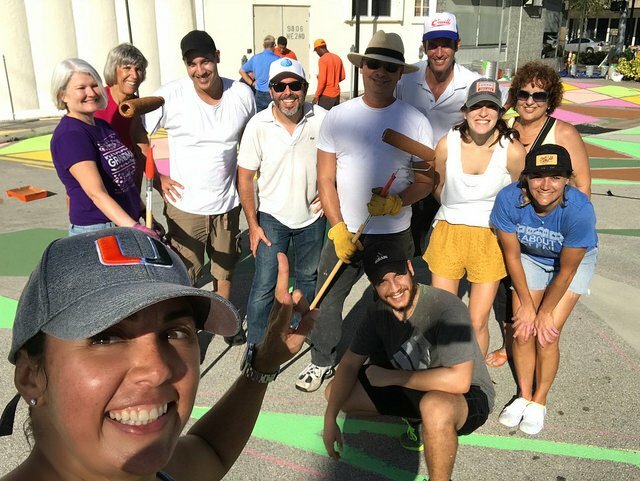 We just may have created the highest point in Miami Shores! In the process of sculpting our pine rockland. Then, we took the plants donated by Fairchild Garden’s Protect to Connect Network and other generous folks, and placed them in a mockup of the garden to come. We thought it looked pretty good! Last, but not least, we took the potted plants to the shade, where they will await the moment when their roots can stretch out into the soil. 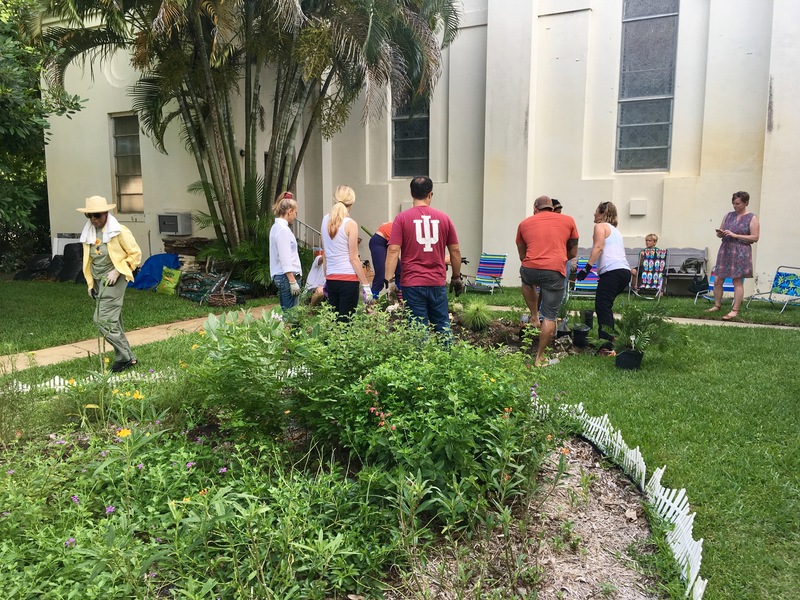 Come join us on Saturday at 6 p.m. at the Miami Shores Community Church for the planting and a celebration of Miami Shores’ Community Garden. Bring your lawn chairs and favorite beverages, and join your neighbors in the relative cool of a summer evening. We look forward to seeing lots of friends and neighbors! 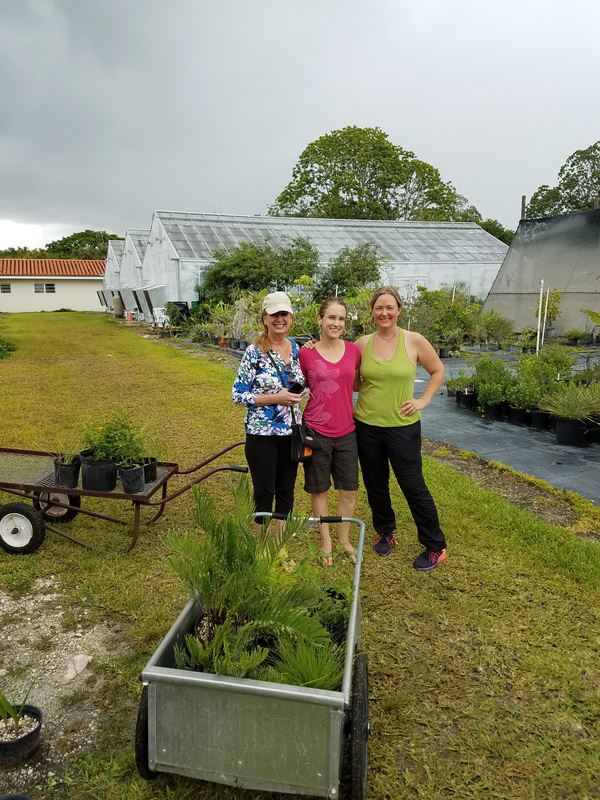 Bound by Beauty connected recently with Jennifer Possley and Peter Vrotsos, both of whom are involved in Fairchild Tropical Botanical Garden’s Connect to Protect Network, which seeks to protect the critically endangered pine rockland habitats of South Florida. We met them at Fairchild’s nursery on a day of threatening skies and downpours, to pick up Bound by Beauty’s five native pine rockland plants, which include host plants for butterflies, as well as plants that provide food for butterflies and other wildlife, and 10 pine rockland plants for the Miami Shores Community Church school’s community garden. 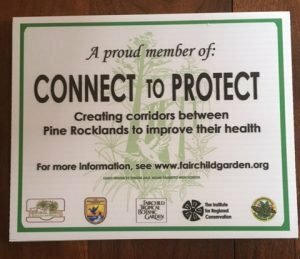 Read more about this very important effort to save pine rockland species, and learn how you can become a member of the network and receive your own native plants here. We will be scheduling a planting at the school soon, so stay tuned! Fairchild Garden’s Connect to Protect yard sign.